After last month’s headline news that China New Energy was a fresh $20M buy into the Leigh Creek Energy Project in the Northern Flinders Ranges, new drama flares as previous Managing Director David Shearwood and other renegade shareholders want Justyn Peters off the board, writes Michael Henry. Many of you will be aware that a group of shareholders (which included the previous Managing Director David Shearwood) (the “Group”) lodged a 249D notice with the Board proposing the removal of myself from the Board. The Board’s legal advisors considered the notice and provided advice that the notice was invalid and based on that advice the Board did not call a meeting. As your Chairman I feel compelled to communicate with all shareholders why the Board and I believe these current developments are not in the best interests of shareholders and are highly disruptive to your Company. Your Board will continue to act in your best interests applying sound corporate governance practice. Consideration of alternate board teams lacks planning and is premature in the extreme. If the Group want to propose a change to the Board and to propose alternate directors they have the Annual General Meeting (“AGM”) to do so. The AGM is the appropriate meeting at which the shareholders may vote on the composition of the Board in an orderly and cost-effective manner. It is interesting that this disruption is taking place immediately after a successful capital raise where the Company worked diligently to raise funds to build the Pre-Commercial Demonstration (“PCD”) facility and commence demonstration of gas by the end of the year (subject to receipt of Government approvals). The demonstration of gas will be a major milestone for the Company and should result in a significant re-rating of the Company. The Board is committed to achieving this goal as quickly and as safely as possible. The Group is proposing to disrupt this process and that disruption will delay the demonstration of gas. The agitation by these shareholders and the issuing of the (invalid) notice have already diverted time and resources of the Company in dealing with this Group. I am not the only shareholder who questions why the Group would alter the composition of the Board that has raised the funds required (subject to shareholder approval of Tranche 3) to deliver the PCD facility. At all times your Board has acted in the best interests of all shareholders and not just the perceived self-interest of a particular group of shareholders. The work that the Board and management have previously undertaken, as set out in previous ASX announcements, has enabled the Company to become fully funded (subject to shareholder approval of Tranche 3) and as announced this week the contracting for long lead items for the PCD facility has already commenced . It is beyond me why any group of shareholders would want to change the composition of the Board and jeopardise the demonstration of gas as soon as possible. 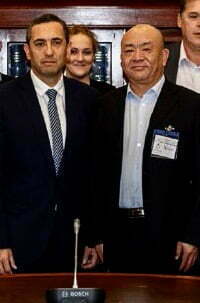 The Board appreciates the support of the vast majority of shareholders and we look forward to updating you over the next few months on our progress with the PCD facility. While the ABC coverage of the largest environmental disaster in Queensland’s history has disappeared from their radar, other sources confirm the Queensland EPA v Linc Energy Liquidators remains strong. The ABC while breaking for public benefit the largest alleged case of willful negligence by corporate executives , has now gone silent on the story. The same question can be asked of the SA media considering the “technical capacity” of the Leigh Creek Energy Project is recycled from Linc and Carbon Energy? 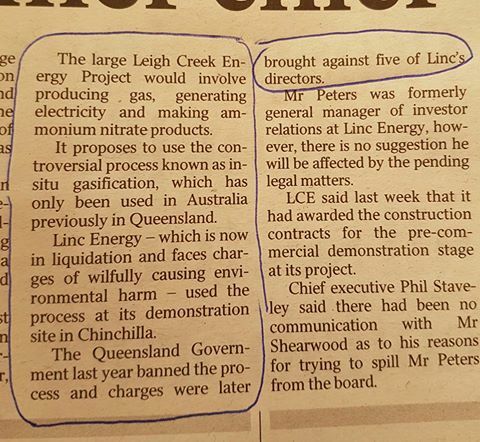 The Advertiser misquotes Mr Justyn Peters previous role at Linc Energy as Investment Relations when he was in fact Environmental Management, no doubt borrowing from his experience within the Queensland EPA prior to his joining Linc Energy. Is this why the ABC remains silent on the case and is this why Peters was not listed as one of the executives called to face charges? The public deserves further and more in-depth coverage of this story by the ABC. which has sadly impacted the lives of hundreds of people at Chinchilla in the now expanded 300 KM square ‘no go zone’ as the outfall from the underground coal (UCG) gas experiment expands and the South Australian Government also remains silent on the situation. The reason for dissension of Shearwater remains a mystery, the company has thrown a second notice in the trash bin, meaning the resolution or outcome must be left until the next AGM. As the previous story ( Marathon – Arkaroola ) is also an intriguing story of ALP participation, the meeting of the Treasurer, China New Energy and Leigh Creek Energy recently is suggestive of something but what exactly is not clear…the next company announcement illustrates the relationship and if the words are read correctly implies an imminent decision to meet the schedule of LCK prior to the submission of an application to extract gas for the purpose of flaring – if this is the case SA enters the Queensland danger zone of the Chinchilla pilot plant UCG disaster so all eyes will be on the Greens next response to this development. Leigh Creek Energy Ltd (ASX: LCK) (“the Company”) advises that following a careful review and consideration of the documents delivered to the company to requisition a meeting of shareholders under Section 249D of the Corporations Act (see ASX announcement dated the 6th June 2017) (“Notice”) the Directors have determined that due to the irregularities in the respect of the Notice, the Notice is invalid and does not comply with Section 249D of the Corporations Act. As a result of this, the Directors have determined not to convene a general meeting of the shareholders based on the invalid Notice. Yes, indeed! Watch this space! Advertiser Image: facebook – poster please contact editor if you object to its use. LIQUIDATORS of Linc Energy said on Friday they have applied to Singapore Exchange (SGX) for a one-year extension for the submission of a proposal to resume trading in the company’s shares. The submission deadline was initially March 29 this year, and the liquidators have now asked for it to be deferred until March 29, 2018. The move to submit the proposal came after Linc Energy’s shares were suspended on March 30, 2016. The liquidators also sought waivers for requirements to prepare financial statements and an annual report, as well as to hold an annual general meeting. The company said the liquidators have been monitoring the criminal proceedings presented against Linc Energy in Australia. “As the proceedings are ongoing with no clear conclusion on the outcome, the liquidators are unable to ascertain the financial impact and legal implications arising from the same on the company. 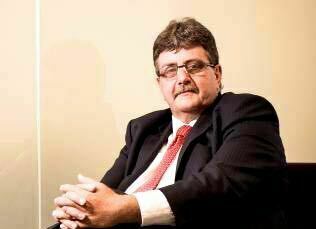 Accordingly, the liquidators cannot engage potential investors and other stakeholders to explore the various options for the company to exit liquidation at this time,” it said. Separately, Linc Energy also gave other updates. It said the sale of mining development licence 361 – the Pentland coal tenement in the Galilee Basin – is expected to be completed by Sept 30 this year. In terms of sale of land, the liquidators have realised two of Linc Energy’s five real property assets in Chinchilla, Queensland. The remaining three properties are subject to an ongoing sales process. On May 5, 2017, the liquidators entered into a deal for the sale of the debt owed by United Queensland Resources to Linc Energy. The sale is due to be completed at the end of June 2017. The liquidators said they continue to progress recoveries from the company’s remaining assets, including the SGX-listed shell as well as loans owed by US subsidiaries that are currently subject to a Chapter 11 process. Following orders made by the Supreme Court of Queensland that the liquidators are not justified in causing Linc Energy to not comply with the Environmental Protection Order issued by the Queensland Department of Environment and Heritage Protection, the liquidators have filed an appeal.